Lap joint stub end is a fitting that is used replace welded flanges when the support of a rotating back up flange is required. And It can be supplied in standard and non-standard ANSI dimension that is used for connecting pipes of different diameter. Stub end are offered in three different ways, type A, B and C. Type A and B stub end are similar to forged fittings, such as elbows and tees, and type C stub end are made in customized sizes. 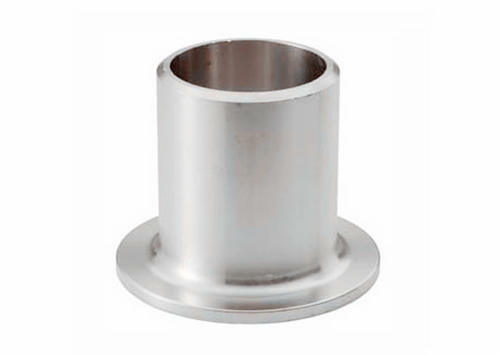 The type A stub end is used for standard lap joint flange. The lap thickness on the stub end is greater than or equal to the nominal thickness of pipe wall. In addition, the outer corner radius of the type A can receive the lap joint flange. The inside corner is square. Lap usually has a machined serrated face. The type B stub end is used for standard slip on flanges as lap flanges. The lap thickness on these short ends is greater than or equal to the nominal thickness of pipe wall. Also, the outer corner radius of type B is small enough to receive the slip o flange that can be used as a backup flange. The inner corner is square. Lap usually has a machined serrated face. The type C stub end can be used for standard lap joint flange and slip on flange. It is flared leaving a rounded edge at the inside diameter of the lap. If necessary, the radius can be made closed to a square. The lap thickness is 75% of the pipe wall. The type C is very short enough to accommodate any backup flange. The lap joint on type C is smooth, and it is not machine. Stub ends are usually manufactured in two ways, Type A and Type B. They are available in two standard length, long (ANSI) or short pattern (MSS). Schedule 5s and 10s stub end are usually offered in short lengths, and long lengths are available on special order. Schedule 40s stub end are supplied in either short or long lengths. b. Can be formed between two dissimilar metals, such as aluminum and copper. Stub end is widely used in the petroleum, chemical, power, gas, metallurgy, shipbuilding and construction industries. It is made from high quality raw materials, and available in a variety of sizes and designs. Wall Thickness: Schedule 5s, 10s, 20s, Sch10, Sch20, Sch30, STD, Sch40 and etc.